Trevante Nemour Rhodes was born in Ponchatoula, Louisiana on February 10, 1990, but raised in Little Elm, Texas from the age of 10. After excelling in sports in high school, he earned a scholarship to the University of Texas where he was an All-American sprinter as well as a running back on the Longhorns' football team. After graduating, Trevante moved to Los Angeles to pursue an acting career, making his big screen debut in Open Windows opposite Elijah Wood and Sasha Grey. A couple of years ago, he landed a breakout role as Black in Moonlight, the gay-themed, coming of age drama which won the Academy Award for Best Picture. 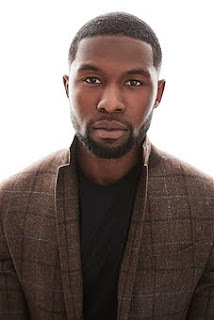 Here, Trevante talks about his latest outing as Sergeant Ben Milo in 12 Strong, a docudrama about the top secret mission of a Special Forces unit deployed to Afghanistan a few days after 9/11. Kam Williams: Hi Trevante, thanks for the interview. Trevante Rhodes: Thank you, Kam. KW: What interested you in 12 Strong? Had you read the book before you got the script? TR: I read the book after I got the script. Although I was obviously very aware of 9/11, I was fascinated by this story which I had never heard about. I thought that these first responders and the way in which they prevailed was not only unique but pretty important. So, I felt that it was awesome to have an opportunity to be a part of turning this little-known story into a movie. Of course, I also jumped at the chance to work with [producer] Jerry Bruckheimer and the terrific cast attached to the project. KW: Yeah, I had no idea we had guys fighting on horseback over in Afghanistan. And they were outnumbered and outgunned by the Taliban equipped with tanks, RPGs and heavy artillery. TR: It was amazing! Those soldiers are heroes, Kam. KW: Editor/Legist Patricia Turnier asks: How did you prepare to play Sergeant First Class Ben Milo? TR: My preparation included speaking to quite a few veterans. They were very open and honest about both their downtime and battle experiences. They shared the good, the bad, and everything in between. We also had Army Ranger training for three or for weeks which was not only educational but very valuable in terms of our bonding as a unit. KW: I assume you didn't work with live ammo. TR: Definitely not. We had a couple guys who didn't know what they were doing, so that would've been scary. KW: Have you had an opportunity to meet the soldier your character's based on? TR: Yeah, just last night at the premiere. He's amazing! KW: Patricia would like to know what you want the audience to learn from the movie. TR: I'd like them to come away with an accurate perspective of what it was like in Afghanistan after 9/11. For instance, I was 11 years-old at the time, and I believed all the people over there were bad. But that's obviously not the case, since the only reason why this mission succeeded was because of a lot of help from some locals. Another message is how valuable connectivity, love, honesty and being there for one another are. KW: She was also wondering whether there's a genre out of your comfort zone that you would like to try? TR: To be quite honest, nothing I've encountered thus far is outside of my comfort zone. I hope that every film I do is very different from the previous one. What I'm always looking for as an actor is to be challenged in a new way. That way I can be educated and grow. It also enables you to appreciate different points-of-view through your own eyes. But I might not be ready to do a comedy yet, unless I could find one with a cool message. KW: Lastly, Patricia asks, what is your opinion of colorblind casting? TR: I always hope that Hollywood casts the best person for a role regardless of what they look like, regarless of their skin color, gender or sexual orientation. And that's been the case in my own experience. I'm very appreciative of where things are at compared to twenty years ago, and I hope they continue to improve in a rapid manner, because we have all kinds of people putting out incredible material and doing phenomenal work. KW: You seem to have gone straight from athlete to acting very quickly and very successfully. Did you study acting in college? TR: No, I just took one theater class during my senior year to fulfill a degree requirement, Kam. A professor did suggest that I pursue it further. Then a casting director spotted me on my campus, and I got bitten by the acting bug. And I saw that if you put in the effort, you'd get a certain reward out of it. Because of that, I love acting! KW: What was it like to be in the Oscar-winning Best Picture, Moonlight? TR: I was really happy that we won because of all the work everybody put into the film. Barry [director Barry Jenkins] puts an incredible amount of love into everything he does. I also like the fact that a great work of art could win, regardless of who you are or what you look like. I hope winning will help Barry get more opportunities. KW: Well, his previous film, Medicine for Melancholy, was phenomenal, too. TR: Yeah! That's what I'm saying, Kam. Even his first college project was amazing. He's great, and I'm very happy for him. KW: What I found incredible about Moonlight was how I barely noticed that the two main characters were each played by three different people. He somehow made the transitions, as they grew older, seamless. TR: I think that's a testament to not only Barry's brilliant writing and directing, but to the great casting and acting and the beautiful cinematography. Normally, people think it's crazy to have different people play the same person. But here, all the elements combined to create a masterpiece. TR: I'm not sure. More than anything, I'm interested in working with the best directors, the best scriptwriters, the best casts and the best crews willing to work with me, because I believe that great experiences translate to great films. TR: [LOL] A bank card and a Chipotle celebrity card. That gets me all the good food. Honestly, it's the thing in my wallet I'm the most proud of. KW: I didn't even know such a thing existed. Thanks again for the time, Trevante, and best of luck with the film.